Here is a nice refreshing treat for the July 4th holiday. In a medium saucepan, combine sugar, water and corn syrup. Stir over medium heat until the mixture comes to a boil. Without stirring, simmer over low heat for 5 minutes. Stir in lemon juice and cool to room temperature. Cut melon into cubes (remove seeds if there are any). Puree 2 cups at a time in a blender or food processor with a metal blade. Stir into the cooled syrup. Pour into ice cream canister. Freeze according to manufacturer's directions. Watermelons aren' ripe here yet. It sounds so good I will have to try it. You make it look good too. Beautifully presented. Looks so yummy. Meg just took her daughter the ice cream maker. Sad as we have all the ingredients in the fridge right now. Of course, the colour helps. I've tried to make sorbet only once. I think I must have beaten it up at the wrong moment because it turned to snow - lemon flavoured snow. It was fabulous but I doubt I could repeat it! So refreshing and perfect for July 4th! Have a happy holiday! I think I need to go and buy an ice cream maker! Wow Phillip! What gorgeous colors! 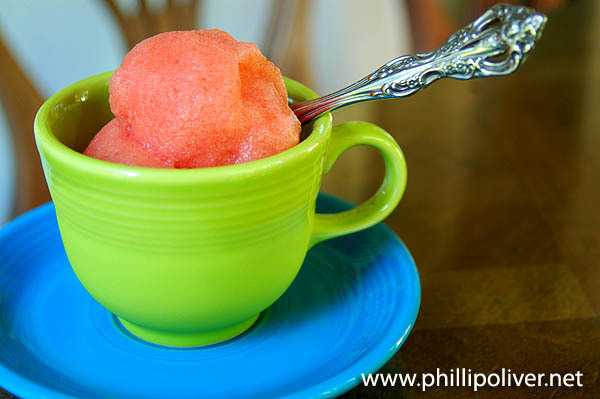 Cold sorbet is perfect for these hot humid days too. Happy Fourth! Thanks Phillip! Also I love the lilies below. They are one of my favorite flowers and unless the voles get them they sure do stand the test of time!